Play the clean energy, digitization, and electric vehicles trends with these three stocks. To buy and hold a stock for a decade may sound daunting, but it doesn't have to be. The stocks you pick can make all the difference -- if you're invested in businesses that'll not just stick around a decade from now but will have grown during the period, you should reap rich rewards. Think businesses that are investing in the future, like clean-energy company NextEra Energy (NYSE:NEE). Or think companies that are positioned to ride some of the biggest emerging global trends, like payments processing giant MasterCard (NYSE:MA) and lithium manufacturer Albemarle (NYSE:ALB). You can easily buy these stocks today and hold them for a decade without losing sleep. Here's why. Two words sum up the future of energy: renewable energy. Be it solar, wind, hydro, or natural gas, the world is warming up to cleaner energy resources, positioning a mega player like NextEra Energy for torrential growth. With a market capitalization of nearly $73 billion, NextEra Energy is the world's largest utility today. What you may not know, though, is that the company is also the world's largest producer of wind and solar energy. That's a killer combination to have: On the one hand, NextEra's defensive utility business ensures a steady flow of income; on the other, clean energy provides a fillip to growth. NextEra is also an incredible dividend stock, having grown its dividends at a compounded average clip of 8.5% since 2005. NextEra expects to grow its dividend by 12%-14% through "at least" 2018 off its 2015 base. The stock currently yields 2.5%. I'm optimistic about management's post-2018 dividend policy that's to be announced early next year, simply because NextEra has solid growth plans to back higher dividends. To give you an idea, the company plans to pump a whopping $40 billion-$44 billion into investments through 2020, the bulk of which will go to renewable energy. Investing in a company that's dedicated to clean energy and committed to shareholders sounds like a winning long-term proposition to me. Did you know that more than 80% of retail transactions are still paid in cash globally? That number, however, is on the decline as the world is gradually going cashless. A recent World Payments report by Capgemini and BNP Paribas projects global non-cash transactions to grow at a record compounded average rate of 10.9% between 2015 and 2020. With its huge payments processing network that spans more than 210 countries and facilitates credit, debit, and prepaid card transactions among others, MasterCard is poised to be one of the biggest beneficiaries of the digital revolution alongside rival Visa. MasterCard is already making boatloads of money, mainly via the fees it earns on transactions made using its cards. While reiterating its "minimum" 50%-operating margin goal, MasterCard recently upped its earnings per share performance target for 2016-2018, now projecting it to grow at a compounded average rate of 20% during the period. In the longer run, I believe India could be a game-changer for MasterCard, as the nation is aggressively going digital, and as a native of India, CEO Ajay Banga should have his pulse on the market. MA Revenue (TTM) data by YCharts. 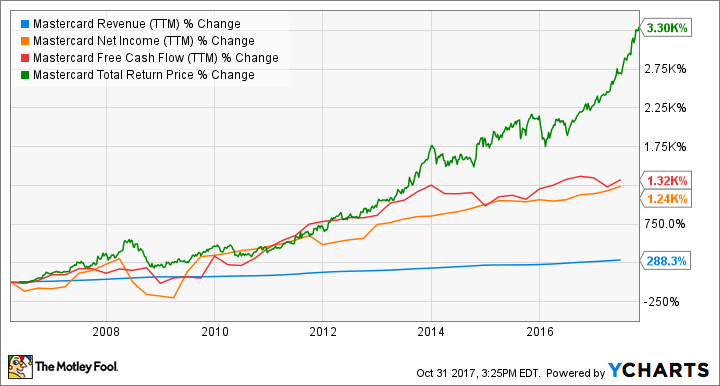 MasterCard's profits and cash flows have grown at a phenomenal pace in the past, and the stock has earned investors jaw-dropping returns. I strongly believe you still have time to join the party, for this could just be the beginning of a fresh growth phase for MasterCard. Tesla may have started it, but the electric-vehicle (EV) fever has now caught up with countries and auto manufacturers across the globe. Sample this: India wants to go all-EV cars by 2030. Meanwhile, France, Britain, and Germany have announced a ban on gasoline vehicles within the next couple of decades. One company that could make a killing as the adoption of EVs takes off is Albemarle. Albemarle is the world's largest manufacturer of lithium, an essential element used to make lithium-ion batteries that power EVs. Lithium made up roughly 36% of Albemarle's revenue last year, with the remainder coming from refining solutions and bromine specialties. Albemarle is expanding aggressively and aims to grow its lithium carbonate equivalent annual capacity by nearly 85% to 165,000 metric tonnes by 2021. The company also has some new lithium resources under development to boost capacity further beyond 2021. In the longer run, Albemarle is targeting 7%-10% growth in sales. There's another solid reason to like Albemarle: It has increased its dividends for 23 consecutive years and looks set to join the elite Dividend Aristocrats group within the next couple of years. While its dividend yield is still tiny at 0.9%, you can't ignore the growth potential in Albemarle's dividends given the company's prospects. If you want to play the electric vehicle trend, Albemarle is one of the best stocks to own today.